Divvy’s first fleet of bikes, set up at the station at Daley Plaza. Chicago on Friday morning launched a new component of its storied transit system. 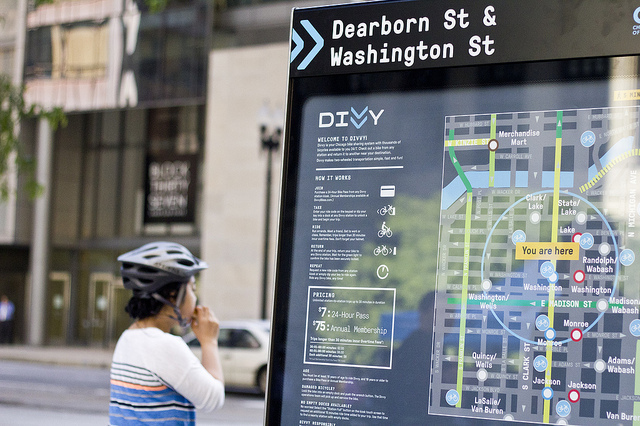 Divvy, the city’s first bike-share program, kicked off with 65 solar-powered docking stations. The plan is to add hundreds more by next spring. With a fleet of 700 powder-blue bikes, the system will be one of the largest bike-sharing operations in the world. But most of the stations will stand within a couple miles of the lakefront, clustered mainly in the Loop and densely populated neighborhoods along transit lines. This in a city that has a checkered history of providing low-income residents equal access to public infrastructure. It begs the question: Who gets to share the benefits of Chicago’s new bike share? The Divvy bikes themselves are heavy-duty commuter bikes with fenders, chain guards, built-in-lights and a small front basket, big enough for a purse or briefcase — but not a load of groceries. The bikes are painted the same sky blue as the stripes on the Chicago flag. Users will be able to pick up a bike at any of 400 docking stations the city plans to install by next spring. After a ride, users will be able to return the bike to any other station. Divvy’s startup financing include $22 million in federal funds and $5.5 million in local funds. The day-to-day operations will be up to Portland-based Alta Bicycle Share, which also runs bike-share programs in Boston, New York and Washington, D.C. Chicago Transportation Commissioner Gabe Klein once consulted for Alta and received criticism when Chicago chose the company for the city’s program. Klein said he recused himself from the selection process. But that doesn’t take into account the proximity of stations or some residents’ limited access to bank cards (more on that below). Divvy is designed for short trips under 30 minutes. After that, late fees kick in. Planners say that the system was primarily designed to address what they call the “last two miles” problem of commuting. Namely, how to get people to work or home after they’ve stepped off the train or bus. Divvy is not optimized for recreational riding or long treks across town. The stations are concentrated in high-density parts of town — in and near the Loop and along some major transit lines. The further from the city’s center, the fewer stations there are. This program stems partly from the city’s desire to spur economic development. Mayor Rahm Emanuel often touts the connection between building better bike infrastructure and attracting high tech companies to Chicago. But this strategy, putting the first stations where the demand is already highest, means that from the outset, some of Chicago’s poorest neighborhoods have been left behind. There are no stations south of 63rd Street or west of Central Park Avenue. Altogether, black West Side neighborhoods like North Lawndale, East and West Garfield Park, Austin, and West Humboldt Park will have just two of the 400 planned bike-sharing stations. The Chicago Department of Transportation said that one-third of its planned bike-sharing stations will be in census tracts below the city’s median income. That proportion is higher than comparable systems in either Boston or Washington, D.C. The city set up a Web portal for suggestions about where to put the stations. The city received about 1,000 suggestions and another 10,000 “likes” on those suggestions. But suggested station locations for the West Side were few and far in between. The city also held five community-input meetings last fall. Three were downtown, one was at a library in Roscoe Village, and just one was in a neighborhood with a high minority population. That was in Bronzeville, which is getting a handful of stations. “The location of the public meetings is in large part driven by our initial service area,” says Scott Kubly, Chicago’s deputy transportation commissioner. Kubly says CDOT has applied for additional grants that would be used to build stations beyond the 400 already planned. If and when that money comes through, Kubly said Divvy would go through a another public planning process to site those new stations. But some West Side residents aren’t content to wait. Tiffany Childress Price lives in North Lawndale and teaches high school there. She bikes to work, as does her husband, who takes Ogden everyday to get to his job as a barber in River North. But Childress Price says people like her and her husband prove otherwise. The problem isn’t a lack of interest but, rather, a lack of education and infrastructure, she said. “It’s going to take city attention, maybe city investment — time and resources into education,” she said. As it turns out, though, the number of black and Latino cyclists has increased dramatically in recent years. In May, the Sierra Club and the League of American Bicyclists released a study that showed rates of minority ridership up all over the country. Planners often measure cycling by the number of trips made by bike. While non-white riders still account for only 23 percent of trips made by bike, according to the Sierra Club study, between 2001 and 2009, the number of trips African Americans made by bike increased by 100 percent. Those made by Latinos increased by 50 percent. In addition, 60 percent of people of color surveyed said “more bike facilities” would encourage them to ride, and there’s a lot at stake. According to the study, crash fatality rates are 30 percent higher for African Americans and 23 percent higher for Hispanics than they are for white riders. CDOT, meanwhile, has asked the city to be patient when it comes to expanding Divvy into more minority neighborhoods. Gabe Klein, Chicago’s transportation commissioner, acknowledged the dearth of stations on Chicago’s black West Side and far South Side, but emphasized the need to concentrate stations in areas with more commerce and residents. Klein compared the nascent bike-share program to the early years of the “L” system before it radiated miles out from the city center. Whether the CTA is truly “everywhere” is a matter of debate, but for now CDOT is holding off on the placement of 20 stations until after next spring. Officials want to assess unanticipated demand, and make some data-driven decisions about where to expand. Even if the city expanded Divvy’s bike stations and led a huge public-education campaign, there are still other potential barriers to entry. First, there’s the cost of membership. And while $75 a year is far cheaper than the cost of an annual CTA pass, the up-front cost could be prohibitive for some low-income users. The bike-share system in Washington, D.C., offers an $84 annual membership that can be paid for in monthly installments of $7. Boston’s Hubway bikeshare, meanwhile, offers steeply discounted $5 annual memberships to anyone on public assistance living within 400 percent of the poverty line. They’ve funded this through the Boston Public Health Commission. So far, the Hubway has sold 650 such discounted memberships in a system of 14,000 members. Boston’s bike share grew out of multiple initiatives from the mayor’s office — one focused on health and obesity, another focused on the environment and sustainability and another on economic development. 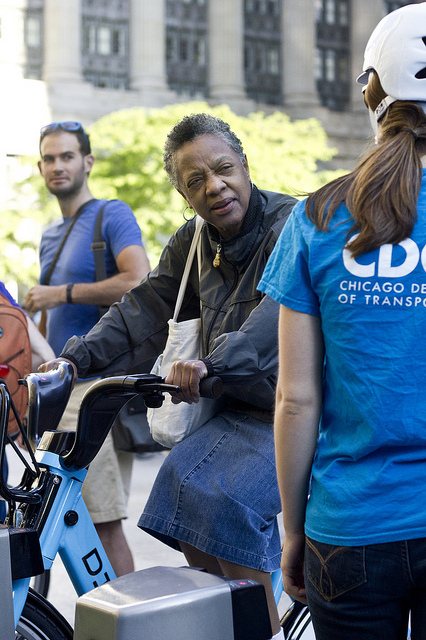 While CDOT officials said they were excited about the public-health benefits of cycling, Chicago won’t be offering either discounted memberships or the option of a monthly payment program to low-income residents here. Equally complicated is the issue of liability. With a few exceptions, in Chicago, you will need a credit or debit card to join Divvy or to rent a bike for the day. The system won’t accept cash. This is about protecting the bikes, CDOT says. If you lose or steal one, Divvy will charge you $1,200 to replace it. If you don’t have a bank account or credit card, if you’re living paycheck-to-paycheck or stuffing your savings under your mattress, you’re what experts call “unbanked.” And if you’re unbanked, you can’t be charged for a replacement bike as easily. So what are the unbanked to do? Divvy and CDOT are planning a unique approach, one that takes banking out of the equation. They plan to partner with community groups including churches and job-training programs. “The community-based organizations [will set] up the rules that work for their members, in terms of how many hours or time they’ll allow members, or how they want to handle the rules around usage,” Kubly said. Then, the $1,200 liability will be shared between the community organization, the city and Divvy — not the user. But the city isn’t specifying a date when it will launch the community partnership program. Cynthia Bell, a lifelong West Sider who works for the Active Transportation Alliance, says the city could do more to encourage low-income biking, with or without Divvy. Bell says the city could do more to help set up bike-repair shops and safe places to park. Tiffany Childress Price, a North Lawndale teacher and avid biker, says the reasons for bringing bike-sharing to low-income neighborhoods go beyond economic development and convenience. “We have the highest childhood obesity rates in the city so it seems like we’d want to promote biking” she said. Chicago has made progress in laying down more bike lanes on the West Side. When it comes to the bike-share system, though, officials say most low-income neighborhoods will have to wait. Robin Amer is a reporter/producer on WBEZ’s digital team. Follow her on Twitter @rsamer.